Fully Featured Wireless Bridge with Effortless Integration. 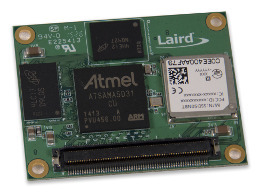 Laird Connectivity’s 50 Series Wi-Fi® + Bluetooth® modules achieve the best possible connectivity in any RF environment, powered by the Qualcomm Atheros QCA6004 and the Cambridge Silicon Radio CSR8811. With industry-leading software, Linux and Android support, and a wide range of form factors, Laird Connectivity’s 50 Series is a flexible option for your enterprise wireless needs. The security and robustness inherited from our expertise in our 40 and 45 Series modules means the most reliable wireless in crucial, even life-critical applications, such as medical and industrial. WB50NBT: On-board Linux-based MPU. Layers of physical/logical security. Operates independent of host. 47mm x 37mm x 4.9mm. Bluetooth 4.0: Enables Classic Bluetooth and Low Energy mode. Complete RF Pathway: Onboard baluns, mobile phone coexistence filter, diplexer, power amplifier, low noise amplifier, and reference crystal oscillator.